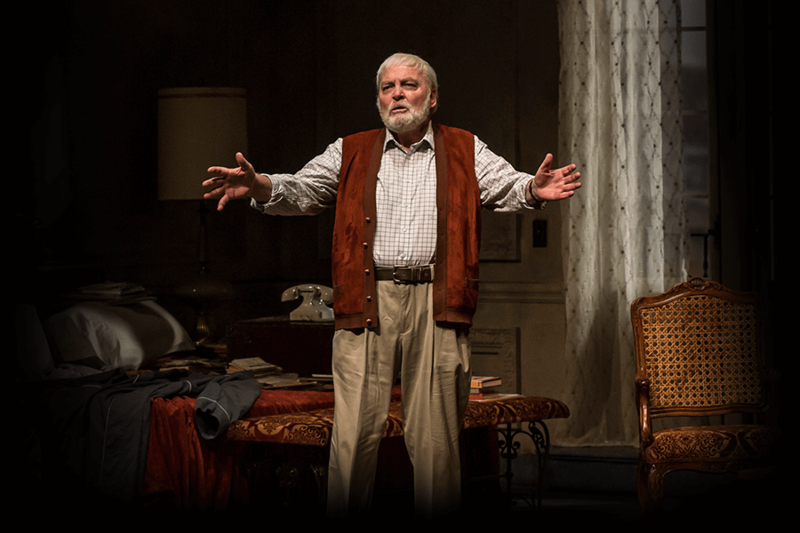 Stacy Keach triumphantly returns to the Goodman in a tour-de-force performance as legendary author Ernest Hemingway. After the prize comes the pressure. Five years after receiving career-defining awards, Ernest Hemingway faces a looming deadline for a story about the rivalrous matadors of Pamplona. In declining health and consumed by the demise of his fourth marriage, he must now conquer the despair that threatens to engulf him. "Hemingway's words, Stacy Keach's courage, battling it out in a hotel room"
"Keach makes for a terrific Hemingway"
"You couldn't ask for a better Hemingway than Keach"
"A one-actor show of the highest order"
"Mines the emotional content of Hemingway's biography"
"There's a clear passion burning inside Keach's performance"
Stacy Keach "remains a force as ever"
"Keach is jovial and witty as Hemingway"